Herbs are usually very easy to grow, not to mention useful, and attractive in your garden. But since many varieties of herbs only grow during the summer months, drying herbs is a common method of preserving some of their summery flavor for later use. If you grow your own garden herbs, you probably know that many varieties, such as basil, dill, mint, and more flourish in the summer, but can’t withstand the colder temperatures of the winter months. Luckily, these herbs are very easy to dry and store for winter, and many of them maintain great flavor for many months when dried. I love dried dill in salad dressings, and dried mint makes a great cup of hot tea on a cold winter’s day! Basil can be dried (or frozen), and used in pesto or pasta sauces. And rosemary and oregano are also excellent in dried form. The flavor and aroma of herbs comes from the essential oils contained in the leaves, which varies depending on the time of day and the stage of the plant’s life cycle. The best-quality dried herbs are picked when the essential oil content is at its peak, which is when the plant is producing only leaves, not flowers or seeds. The heat of the sun causes essential oils to vaporize and fill with air with their aroma. For this reason, it’s best to harvest herbs in the morning while the leaves are still saturated with flavor. Not too early, however, because they won’t dry as easily when they’re covered with dew. Aim for the brief window when the sun has just hit them and the dew has dissipated. Use scissors to clip off the stems, cutting only the fresh new top growth, not the older leaves lower down. To avoid depleting the plant, harvest no more than one-third of the growth at any given time. Most culinary herbs are perennials, but with annual herbs (like basil, cilantro, and dill), it’s fine to harvest all of the fresh healthy leaf material in the fall since the plants will die with the first frost. 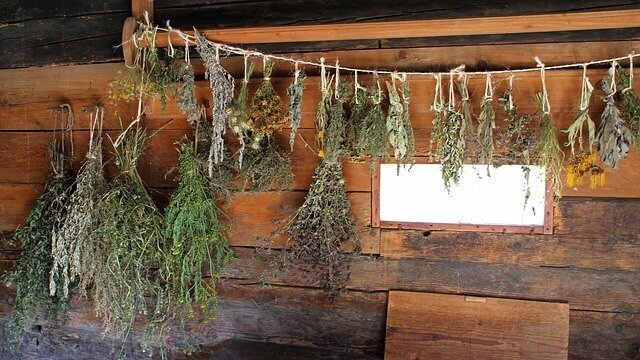 The classic way to dry herbs is to hang them from the ceiling of your kitchen…. Simply bundle five to 10 herb stalks with a piece of twine, and hang them up upside down…. You can put the herb bundles in any room that’s warm and dry…. …Herbs with high water content…may dry too slowly if they are bundled and hung, rotting before they are fully dry. As an alternative, spread them out flat on a window screen that is suspended off the ground so that air can circulate beneath it…. If your herbs are getting moldy because the humidity level in your home is too high—or if you’re in hurry— you can dry herbs quickly in a food dehydrator, or even in the oven…. Herbs are ready to store as soon as they become crisp and crumbly to the touch…. Bundled herbs take several weeks to dry, while herbs laid out on drying screens may be ready in a week or less. The oven method produces dry herbs in as little as two or three hours. Always store dried herbs in glass containers in a cool, dark place…. For the full article, visit ModernFarmer.com….